Custom Railings for Deck, Balcony, Stairs, Porch or Loft. Home » Custom Railings for Deck, Balcony, Stairs, Porch or Loft. Our artist loves designing custom railings! Meet our professional artist and owner of NatureRails LLC, Rob Gerdin. Rob is a self-taught artist who sold his first commissioned painting at the age of 13 and has owned and operated NatureRails LLC for over 12 years. Rob creates amazing custom railing single panel scenes as an accent or focal point for your your stairs, balcony, deck, loft or porch or a complete welded railing system. All custom metal railing panels are designed with a special decorative touch, and finely crafted with American-made products. Each project utilizes Rob’s exceptional attention to detail throughout the design and fabrication process. Each custom railing is shipped with a signed Artists Certificate of Authenticity, signed by Rob. Whether you want an entirely new design theme, or you just need one of our designs in a different size our team will help you create the perfect custom railing or balustrade. We will answer all of your questions before we begin cutting any metal. We can also use your own photographs in your custom design. Silhouettes of dogs – sorry no cat people yet – or children are popular examples as well as aircraft, boats and landmarks. Rob can even use stick figures on a napkin (just send us a snapshot from your phone) as inspiration for your custom railing whether it will be used on a deck, staircase, balcony or loft. We have turned several artists paintings into custom metal railings which included salmon swimming upstream in Alaska and a field of poppies. Get more design ideas from our customer installation photos gallery and review the feedback sent in by very happy customers. After you review your proof set, you may make any changes to enhance the original proof. We work with you to finalize the changes which includes a minimum of five (5) free revisions at no extra charge. 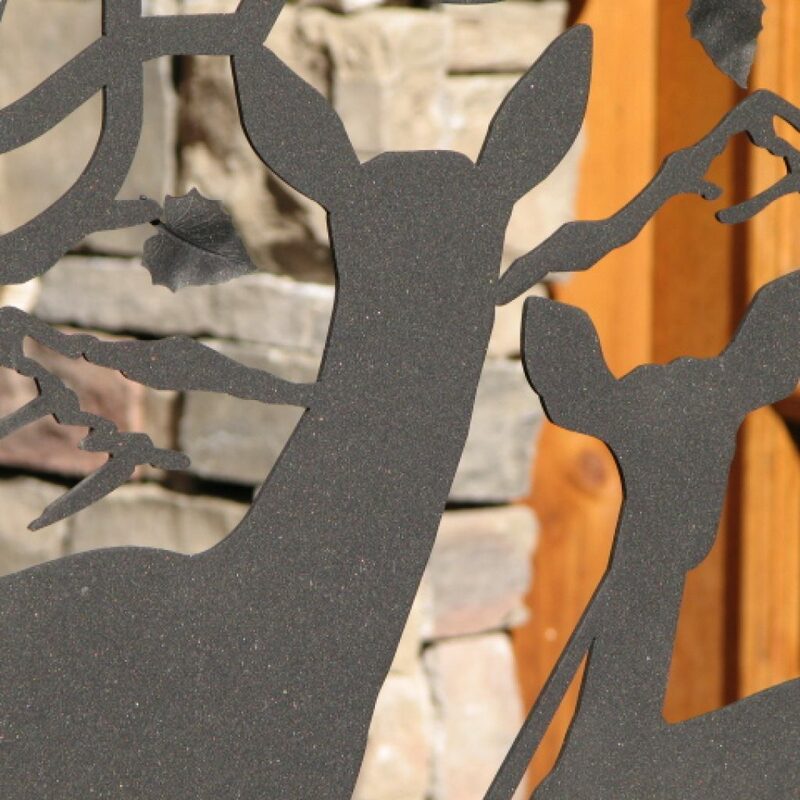 After we have your signature on the final design draft, we cut the metal with a high precision laser jet or water jet machine that leaves a smooth cut edge that is never sharp to the touch. The detail will amaze you! Picture fangs on a wolf or delicate spots on a fawn in the forest. If the custom railing includes welding as part of the design, it will be taken there next. The next step is to clean the metal. Your steel or aluminum panels will be thoroughly cleaned with our 2 step process. We sandblast the product for a super smooth finish and better adhesion of the powder coat. After the sand blasting, we wash the custom railing with an acid bath that includes a rust inhibitor. It is very important to have an immaculately clean surface so that the powder coat adheres perfectly to the steel or aluminum, providing a long lasting maintenance-free finish. NatureRails offers products fabricated out of steel usually, but we also install custom railing near salt water and use aluminum for those areas. Please let us know your preference when you request a quote or we would be happy to discuss the best option for your custom railing project and make a recommendation. Finally the metal is powder coated in the color of your choice. Powder coating is sprayed on and then baked on in an enormous oven. Watch these Custom Railing Creation Videos to get a more detailed look into the custom creation process. Our most popular color selections include textured black, textured copper, oil rubbed bronze, robust brown, hammered white, and more. Upon order placement, metal color chip samples can be sent to you for perfect matching. So how long will it take to get your railing panels? Custom work is transformed from your ideas into a real product in as little as 3 weeks—or as long as 2 or more months. Factors in delivery time include whether or not your job requires welding, the quantity of custom railing panels ordered, how many revisions are required until the design proof is finalized, and current workload at the shop. We attempt to work toward your desired schedule and communicate with you during the entire process. By now you are wondering how you get started on your own railings. Here are a few questions to get your started. 1. Are you installing into wood or metal posts? 2. Do you want a welded custom railing panel section that you simply bolt in for installation? 3. Are you providing your own posts or will NatureRails fabricate those for you as well? 4. What is the measured distance horizontally in between where your posts where the custom railing panel will be installed? 5. How tall do you need the custom railing? For a typical 36” installation, our standard height of 30” usually fits perfectly. All of our custom railings are designed with a maximum 4” in gap in the design that meets or exceeds all safety requirements. Custom Railing is priced at $230.00 per lineal foot and up with a standard 30 inch height. Example: If you have a 30”x72” custom panel, without welding, your price is $230 per lineal foot for a full artwork panel, or $1380 plus UPS shipping. Please fill out our Quote & Question Form by providing your size(s) and a total number of sections. Please include your mailing address for shipping quotes as well. We email or call you with a quote for your project. Looking for something with a little less bling? Check out our newest line of Decorative Baluster Railings with a Variety of Borders, that compliment artwork focal points nicely. We have everything to fit any style; rustic, modern, traditional, classic or beachy.